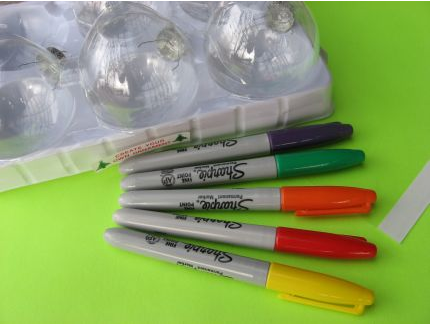 Here is a simple and fun craft that any child that is old enough to color with Sharpie markers will enjoy! 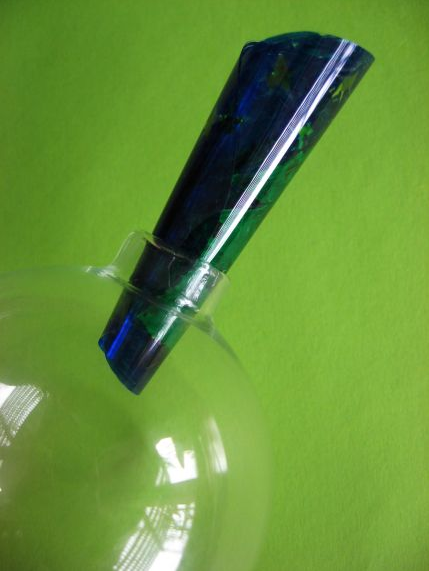 The hardest part of this craft is getting the correct size of circle that will fit into your glass ball. You may download the size of circle we used if you are using 2.63 inch glass ornament. 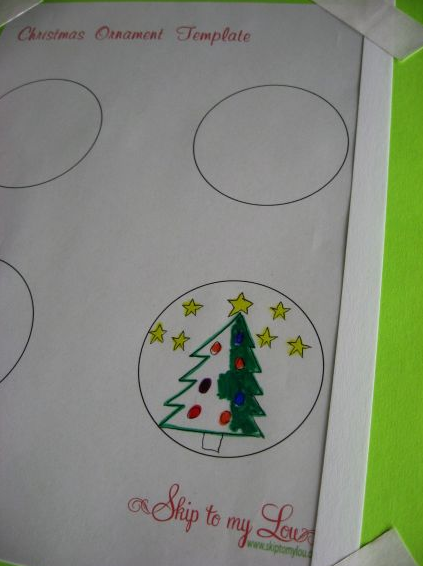 You can also measure around the ornament and then divide that number by 3.14. 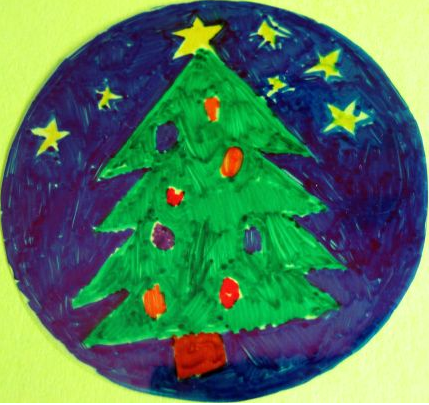 Make sure you test a paper circle in your ornament before beginning this project! Next, cover the drawing the the transparency. Tape corners down to prevent slipping. 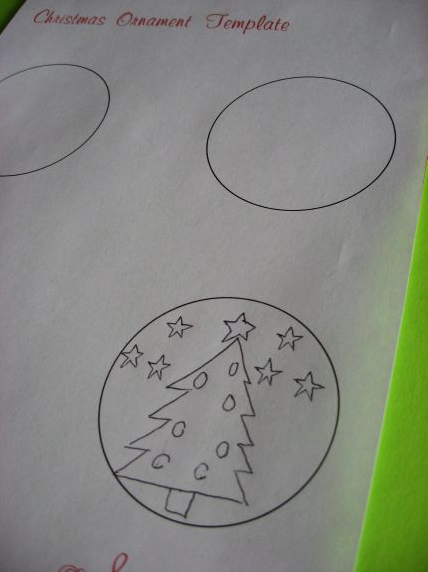 Trace the circle and then color in the design with the Sharpie markers. Cut out the circle, just slightly inside the line. Roll up the circle and send it into the the glass ornament. It should fit snugly inside the ornament without bending too much. The plastic circle will flatten out. You can adjust the placement with a pencil and tweezers. If you need to remove the plastic you can pull it out with tweezers. 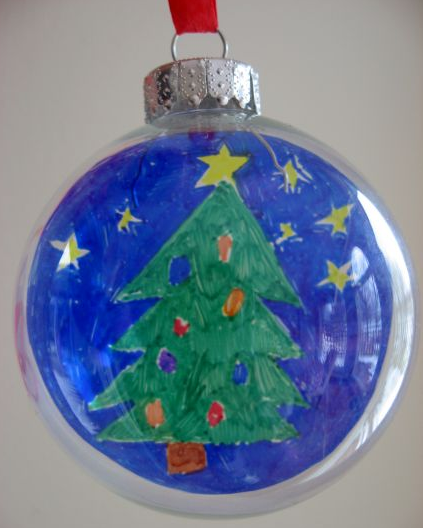 A beautiful keepsake of your child’s artwork! I love this. My daughter is an artist (that’s actually what she calls herself–she’s 8 LOL) and she has so much art in our house it’s not even funny. This would be a great way to display some of it. This one is definitely going into the memory banks! My daughter is only two but we are so going to make these one day! Pluse it’d be a great craft to do with a classroom! This is such a fabulous idea! Cindy is so creative! What a fun project! Thanks for posting this. My daughter will love trying this. I LOVE this idea! Cindy you are a genius! This would be pretty with pastel, transparent colors, too, so the tree lights could shine through. Very nice idea! I’ve done this sort of thing with photos as well. The photos are printed onto photopaper, actual photos are too thick to roll. What A FANTASTIC idea!!!!!!!!!!!! Lovely! !